I'm excited to let you know that our congregation will be involved in opening doors to a new group of people who will be able to experience the blessing of Scouting. As you may know, Trinity United Methodist Church serves as the Chartered Organization for both BSA Troop 60 and Cub Scout Pack 830 here in Orrville. Essentially, that means that our congregation has chosen to support these ministries which connect to the community. As the Chartered Organization, we also carry the responsibility of making major decisions about the direction of the program and its leaders. Scouting's values of helping young people to become trustworthy, loyal, helpful, friendly, courteous, kind, obedient, cheerful, thrifty, brave, clean, and reverent align well with who we are as the people of God. At Tuesday's Ministry Support Team meeting, we heard from several of our BSA (Boy Scouts of America) leaders who helped us understand some of the recent changes taking place in Scouting, especially those related to allowing girls to participate with the same opportunities as boys currently have. About a year ago (Fall 2017), the national BSA made a decision to welcome girls and young women into their programs. The change would need to be voted on at a local level, as they gave packs the ability to either go ahead and recruit girls or to remain all-boys. Scoutmaster Bob Simon, Cubmaster Michael Robinson, and Chartered Organization Representative Dan Hullinger presented some helpful information and answered a number of questions and concerns that our committee had in order to make a decision on behalf of the congregation. Specifically, they asked that we consider opening our Cub Scout program to girls, indicating that around a dozen girls and their families had already expressed interest in joining the program for this school year. They also shared that the parents of these girls were willing to step forward and take on leadership roles so that there will be enough adults to make sure the appropriate amount of male and female leadership will be in place, ensuring that safety policies are fulfilled. Several key items brought to our attention included the fact that scouting has been treated as co-ed in most every other nation in the world, except for the US and Saudi Arabia. Also, they let us know that girls have been informally participating in Cub Scout packs for a very long time. Sisters of the Cubs have often been doing many of the same activities as their brothers, without earning badges for their work. The kinds of activities that girls would be able to do in Cub Scouts are generally quite different than they would do in a Girl Scout troop. 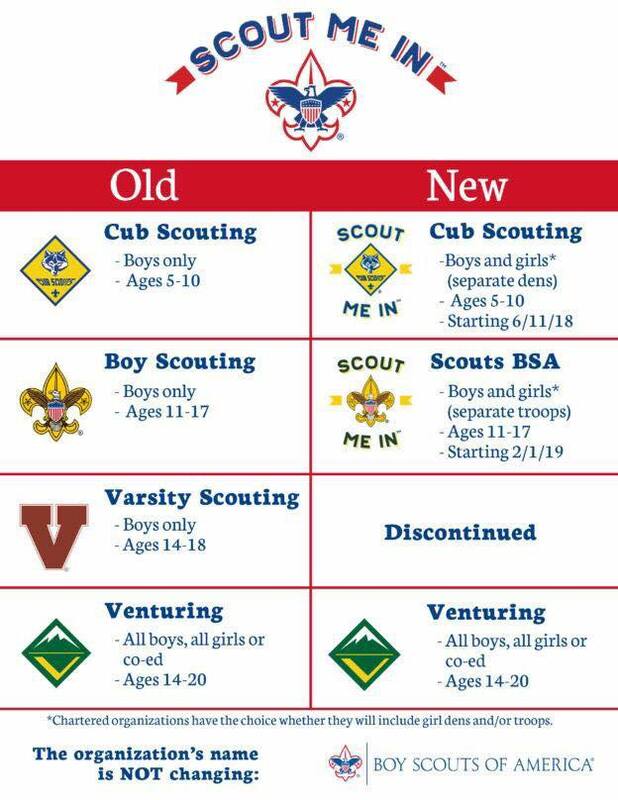 Finally, they made us aware that several other local Cub Scout packs (including Dalton and Smithville) have already made the decision to open their packs up to girls. After a time of discussion, our Ministry Support Team, which functions like an Administrative Board for major decisions like these, voted to have Cub Scout Pack 830 become co-ed, effective immediately. This means that girls are now welcome to participate in our Pack the same way that boys can. It's important to note that there will be a number of safeguards in place to protect the children and their leaders. For example, all adult leaders have to be background checked, and there is a requirement about both male and female leadership being present with the kids. We feel confident that our Scouting leaders will continue to do a great job of making sure that appropriate boundaries are in place. I am grateful for the careful and thoughtful work of our leaders who, I believe, have come to a decision which will positively impact the lives of young people, both male and female, for generations to come. It is a decision that is in alignment with the values of the United Methodist Church, which allows and encourages both women and men to serve God fully and faithfully, including answering the call to ordained ministry. Please pray for our scouting programs, that they will bear good fruit which will last. This week's sermon will be "A Life of Generosity," based on theme scripture from Philippians 4:10-20 (CEB). The choir will be singing "O Love" at 9:00. Grief Share: Meeting in Fellowship Hall Annex each Wednesday from 5:30 - 7:00 PM through November 14. Contact church office to register. Women's Bible Study: Join Sherry Leggett as she leads a Women's bible study on the book of Philippians in the church library beginning at 5:15 pm. If you would like to join, please email office@orrvilletrinity.com and download the First 5 App on your iphone, kindle, or android. Youth Bible Study: Meets at Jenn and Drew Wolfe's House from 5:00-7:00 pm on Sunday, September 23. MYF Cedar Point Trip: Sunday, September 30 from 8:45 am - 7:30 pm. Youth will worship together at the 7:45 am service and leave from church. Parents, check your email for more details. Please keep the office updated on the status of those on the prayer list. Requests will stay on the list for one month, unless the office is notified otherwise. Thank You!